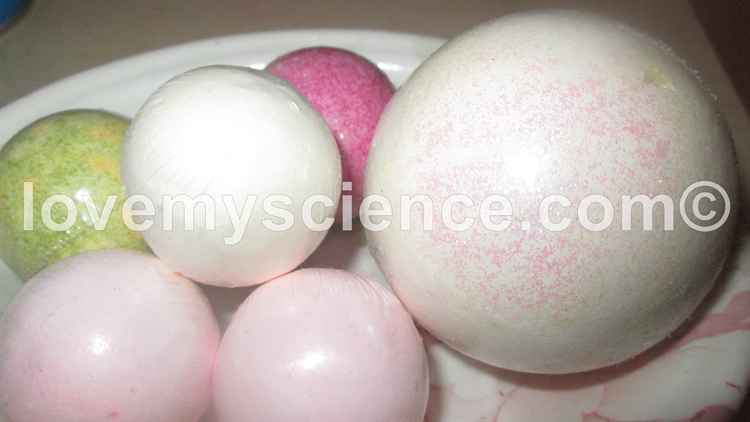 Fizzy Bath Bombs - Reactions & Getting a Reaction Experiments. Once you have mixed all the above together we'll start forming a ball shape and mist spray the ball just slightly to help hold in together into its shape. This is where you could use the tennis ball halves to form a ball or just use your hands. Squeeze the mixture and mold it into a ball. You will need to let them dry for at least 24 hours. Enjoy your next bath using your experiment that you prepared earlier. Here is the Science behind Bath Bombs: It is called neutralization - the fizzing of the Bath Bomb is caused by neutralization. The citric acid and bicarbonate of soda (sodium hydrogen carbonate) are the two powders in the Bath Bombs. As they both need water to react they start to fizz as soon as you drop them into the bath water. This is where the carbonate neutralizes the citric acid and makes carbon dioxide gas which fizzes in the water.